Sparse neural codes (i.e. codes in which neurons respond only to a few stimuli) have been widely observed across animal taxa [1–4]. Theoretical studies suggest that sparse neural codes critically depend on non-linear mechanisms . However, the network and cellular properties that enable the observed sparse responses remain unclear. We investigated sparse coding in neurons within the midbrain torus semicircularis (TS) in the weakly electric fish Apteronotus leptorhynchus, which is equivalent to the inferior colliculus in the mammal. These fish generate a quasi-sinusoidal electric field via the electric organ discharge (EOD) with a characteristic frequency that varies across individuals. When two individuals come into contact, interference between their EODs will give rise to a beat phenomenon. Male Apteronotus leptorhynchus will transiently increase their EOD frequencies in a stereotypical manner during agonist encounters or courtship rituals: these chirps will occur in conjunction with the beat and must be distinguished by either the other male or the female (Figure 1). We performed in vivo patch clamp recordings to study TS neural responses to chirps occurring on top of the beat pattern. We found that one neuron type responded almost exclusively to chirps in a most peculiar manner. These neurons had little or no activity during the beat and fired a single action potential in response to the chirp (Figure 2). Chirp detection was negatively correlated with phase locking to the beat suggesting a segregation of information flow in midbrain neurons. Moreover, the chirp detection abilities were highly superior to those found in neurons afferent to TS. This indicates that separate streams of information arise in the torus and may be used to guide different behaviors by higher brain regions. We investigated the cellular mechanisms underlying this sparse coding. 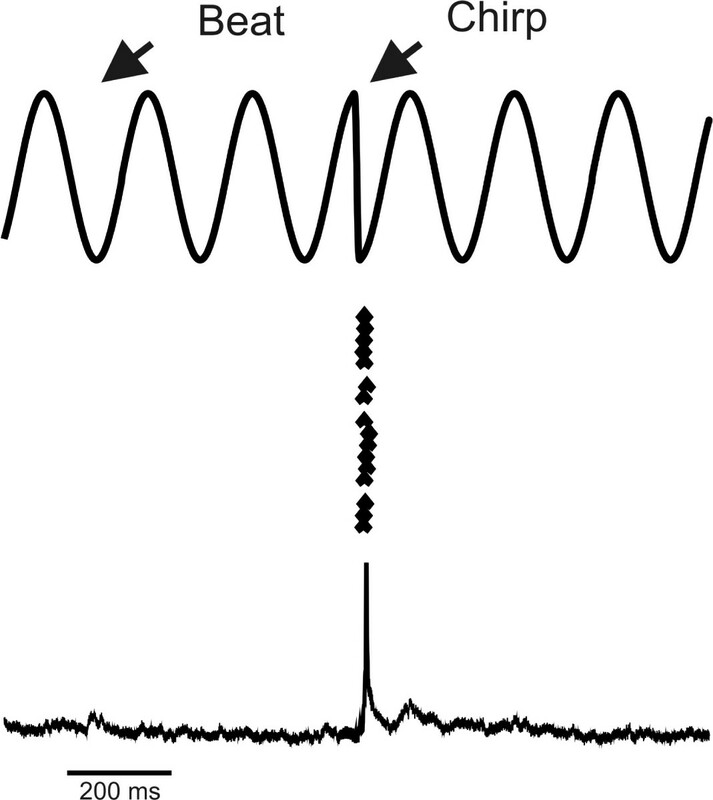 A combination of mathematical modeling and further experiments indicate that shunting inhibition hyperpolarizes the membrane potential below the firing threshold during the beat and increases the membrane conductance which promotes coincidence detection of synaptic input caused by the chirp. We speculate that a potassium conductance then hyperpolarizes the membrane potential after the first action potential: thereby enabling these neurons to respond to each chirp with a single action potential. Our findings reveal cellular mechanisms for the segregation of information flow and sparsening of neural responses to behaviorally relevant stimuli. These mechanisms may generalize to other sensory systems with which the electrosensory system shares similarities: in particular the auditory system. 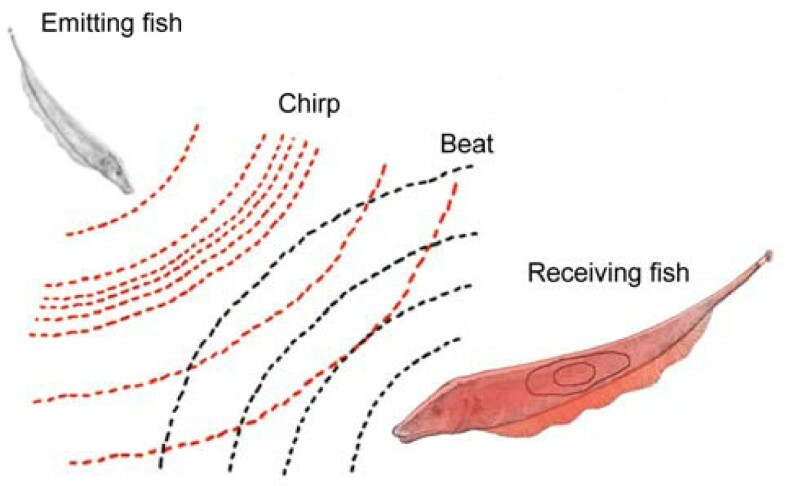 Chirps are transient frequency rises superimposed on top of the beat caused by two fish's EOD. Response of midbrain neuron to natural communication signal "chirp". This research was supported by CIHR, CFI, and CRC (MJC).